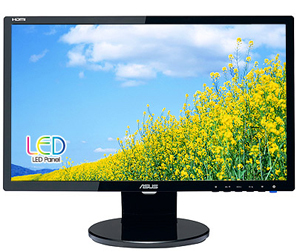 The ASUS VE228H is an affordable desktop monitor solution for everyday PC usage. It features a Full HD 1080p resolution and an impressive ASCR (ASUS Smart Contrast ratio) of 10,000,000:1, and utilizes innovative Splendid Video Intelligence technology, producing high-quality images with saturate colors and fine details. Its built-in hidden stereo speakers provide premium sound for multimedia enjoyment. Complete with a multitude of connection ports, user-friendly designs, and eco-friendly features, it’s great for any office and home use.